Unfortunately, I am using MS Office Professional Plus 2016 and I do not see either option available to me. Interesting. I thought the smile/frown thing started in 2013. Let me check my other laptop. Appears Feedback isn’t available on all flavors. 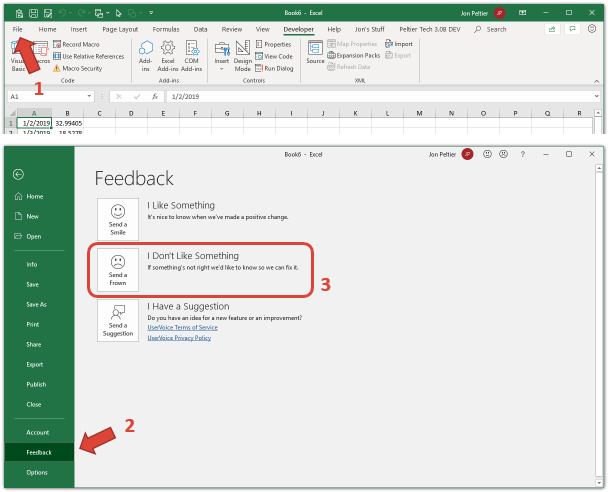 I’m running Office Pro Plus 2016 and there are no Feedback options. Office 365 puts the smile icon right in the ribbon. 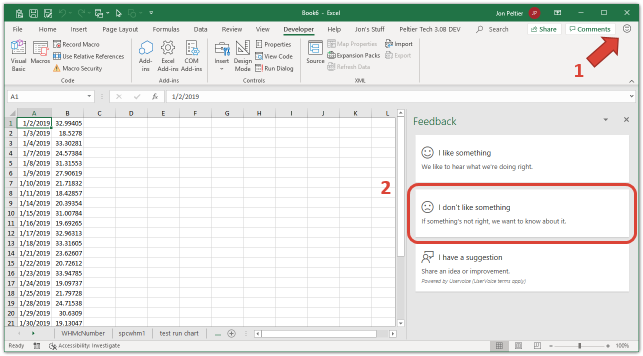 Excel 2016 (non-Office 365) doesn’t have the ribbon icon, but if you click the File tab, you can still find Feedback in the list, and send a Smile/Frown from there. 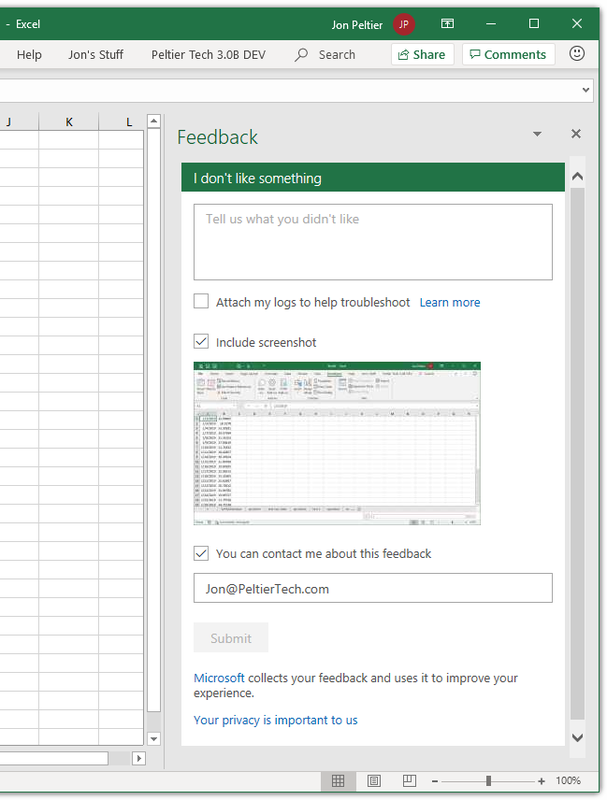 As I just told Paul, on my Office Pro Plus 2016, I can get to Feedback through the File tab. However, my corporate IT department (i.e., me) has not put any policies in place restricting Office. I wonder if that’s what is happening on some of these computers. I just double checked. In the file menu, all I have are: Info, New, Open, Save, Save As, Print, Share, Export, Publish, Close, Account, Options. No Feedback option. I have also checked with IT and they have not put any policies in place to restrict it. Not a big deal on my end, just interesting that it is not there. I checked the registry and HKEY_CURRENT_USER\Software\Microsoft\Office\16.0\Common\feedback\enabled = 0 so the Feedback feature has been disabled. Not sure why IT would bother to do this nor why MS would ship a version with this turned off. 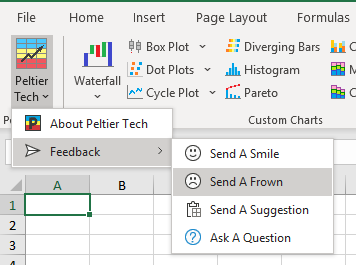 The “Send a Frown” feature within Power Query still surfaces when a problem crops up. Thanks, Jim. 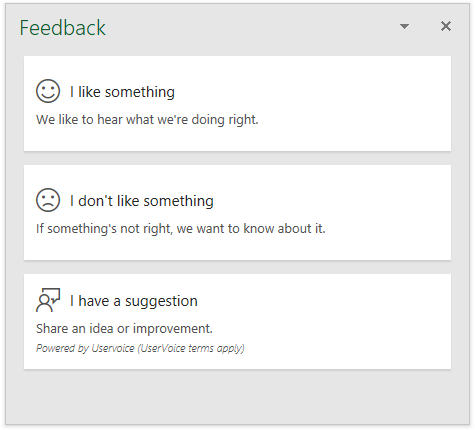 After you and Paul reported that you had no Feedback options, I sent an email to my friends at Microsoft to see what was going on. I imaging they will mention this registry setting, but you win by getting there first. And I would have thought that I’ve sent more than 31 from this computer. Interesting – when I go into the registry, there is no feedback folder under HKEY_CURRENT_USER\Software\Microsoft\Office\16.0\Common\feedback. However there is under 15.0. Anyway, as I said earlier, no big deal for me. I just find it intriguing and interesting. Now what would be cool would be to figure out a way to coopt this Feedback mechanism for my own use – to have my users send feedback on my applications to me. On my other laptop, on which I have Office 2016 and 2013 installed, there was no registry key like this, and the Feedback entry was available on the File tab, but no Smiley icon was present on the ribbon. and it was set to 0. When I changed it to 1 and restarted Excel, the smiley icon appeared on the ribbon, but there was still no Feedback item on the File tab. I think that first appeared in 2016. I’ve incorporated the same kind of feedback mechanism on my commercial charting add-in. All entries in the menu open a new email, with the applicable subject line. Very nice. Much slicker than my hyperlink-sending emails.